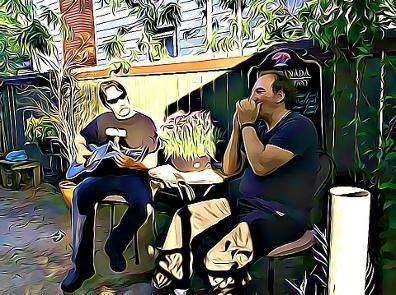 Tony Vani and Kenny Pauze, a recently established duo in the Quinte Area blues scene but certainly not new to the music world; two highly seasoned musicians paired in this sizzling acoustic format for rare appearances. Tony Vani, from Belleville, Ontario, a skilled harmonica player/vocalist has performed at the Kingston Blues Festival as well as the Frankford Blues Festival and in and around the Belleville area as a single act and as a group act for decades. Kenny Pauze, a gifted Delta Blues and Folk guitarist from Elgin Quebec, has played in clubs and festivals including the Ottawa Folk festival and the International Tremblant Blues Festival. The music focuses on blues and folk styles, yet covers a diverse range of styles from hot and feisty up tempo boogies, to down and dirty blues.